James P. Abulencia is an Assistant Professor at Manhattan College. He received his BS degree in chemical engineering from Manhattan College, and his PhD in chemical and biomolecular engineering from Johns Hopkins University. In addition to teaching fluid flow, his research interests include the role of shear stress in blood thrombus formation, the gene regulation of chondrocytes, and tissue engineering strategies of osteochondral tissue. Louis Theodore, PHD, is a Professor in the Chemical Engineering Department of Manhattan College. Dr. Theodore is coauthor of Introduction to Hazardous Waste Incineration, Second Edition; Handbook of Chemical and Environmental Engineering Calculations; author of Nanotechnology: Basic Calculations for Engineers and Scientists; and a contributor to Perry's Chemical Engineers' Handbook. I. Introduction to Fluid Flow. 1. 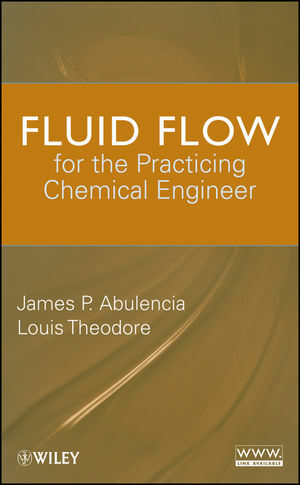 History of Chemical Engineering—Fluid Flow. 2. Units and Dimensional Analysis. 2.3 Buckingham Pi (&pi;) Theorem. 3. Key Terms and Definitions. 4. Transport Phenomena Versus Unit Operations. 5.2 Newton’s Law of Viscosity. 6.2 Classification of Non-Newtonian Fluids. 7. Conservation Law for Mass. 8. Conservation Law for Energy. 8.3 Total Energy Balance Equation. 9. Conservation Law for Momentum. 9.2 Microscopic Approach: Equation of Momentum Transfer. 11.2 Boyle’s and Charles’ Laws. 11.3 The Ideal Gas Law. 12.3 Strain Rate, Shear Rare, and Velocity Profile. 12.4 Velocity Profile and Average Velocity. 13. Laminar Flow in Pipes. 14. Turbulent Flow in Pipes. 14.3 Relative Roughness in Pipes. 14.6 Flow Through Several Pipes. 14.7 General Predictive and Design Approaches. 15. Compressible and Sonic Flow. 16.2. Gas (G)-Liquid (L) Flow Principles: Generalized Approach. 16.3 Gas (Turbulent) Flow—Liquid (Turbulent) Flow. 16.4 Gas (Turbulent) Flow-Liquid (Viscous) Flow. 16.5 Gas (Viscous) Flow-Liquid (Viscous) Flow. 16.6 Gas – Solid Flow. IV. Fluid Flow Transport and Applications. 18.3 Expansion and Contraction Effects. 18.4 Calculating Losses of Valves and Fittings. 18.5 Fluid Flow Experiment: Data and Calculations. 19.2 Manometry and Pressure Measurements. 20.3 Indoor Air/Ambient Air Comparison. 23.2 Particle Classification and Measurement. 23.7 Drag on a Flat Plate. 24.3 Hydrostatic Equilibrium in Centrifugation. 25. Porous Media and Packed Beds. 26.5 Bed Height, Pressure Drop and Porosity. 26.7 Fluidization Experiment Data and Calculations. 27.4 Filtration Experimental Data and Calculations. 29. Accident and Emergency Management. 30.7 Engineering and Environmental Ethics. 31.3 Simultaneous Linear Algebraic Equations. 32.2 The Need for Economic Analyses. 34.2 Developing Students’ Power of Critical Thinking. 34.6 Angels on a Pin.